Description: Q STPLAC1-14 With BNSF 8234, BNSF 8181, BNSF 7789, & BNSF 4772 with 84 Loads, 8331 Tons 7691 Feet. Photographed at 15:45. Description: Q STPLAC1-14 With BNSF 8234, BNSF 8181, BNSF 7789, & BNSF 4772 with 84 Loads, 8331 Tons 7691 Feet. Photographed at 16:00. Description: Q STPLAC1-14 With BNSF 8234, BNSF 8181, BNSF 7789, & BNSF 4772 with 84 Loads, 8331 Tons 7691 Feet. Photographed at 16:08. Description: Renumbered to BNSF 1458. Description: Just for the record. Description: After a trainline issue, 8165 starts rolling at MP 23 in Downers Grove. Z STPCHC2 28 with BNSF 5006 sits down at the holding point. Description: I tweeked this shot of the U-NTWEOL - Quite an impressive train 68 89 foot flats with 11 pipe sections on each! Description: 67 cars of pipe make up this U-NTWEOL today - It was an awesome looking train indeed! Description: Loaded pipe train U-NTWEOL. Description: Loaded pipe train U-NTWEOL snakes along the Mississippi River. Description: Z SBDWSP2-21L With BNSF 663, BNSF 8616, BNSF 8167, & BNSF 8181. Photographed at 07:56. Description: Entering the yard with a pair of SD60M's today. Description: Y-NTW1501 the BNSF-CP Transfer returns to Northtown Yard. Description: Still using the same two SD60M's, the Transfer heads upgrade at Como with the right one leading the way. Description: Todays BNSF BN-CP is seen roaring up the Saint Paul Sub just before it ducks under Jackson St. Description: The BN-CP Transfer gets ready to depart Saint Paul Yard and head back to Northtown and call it a day. 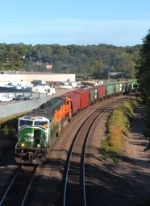 Description: U-STCGAL smokes it up as it departs La Crosse - SWEET consist for 2010!